Looking for the best way to trap a pesky raccoon in your yard in 2019? Then you've come to the right place! 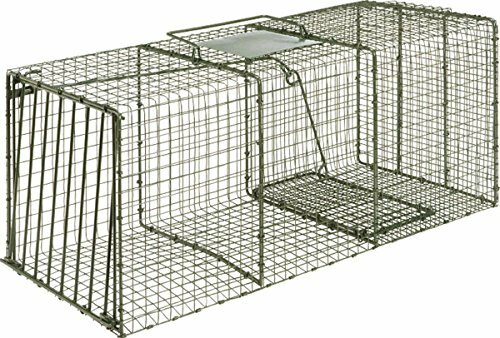 Out of the raccoon traps we reviewed, we really liked the Havahart 1045 Two-Door Live Animal Trap the most. Well, in short, this particular trap is a non-lethal, animal-friendly option which won't break the bank. The trap is easy to assemble and lightweight compared to other traps while still being sturdy. It's a snap to set and use, even if you've never trapped a live animal in your life. 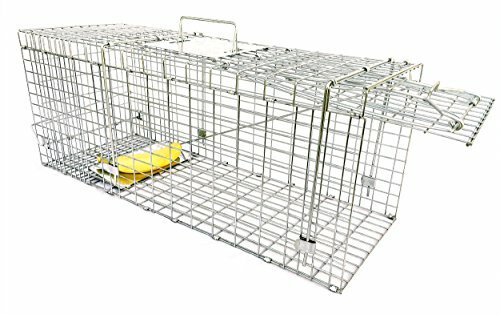 If you want a heavier option, you can invest in the Duke Traps Heavy Duty Cage, which is not only physically heavier but also uses tougher materials and can capture larger raccoons. Please remember that raccoon traps are not 100% effective and it is possible for a raccoon to escape because they are intelligent creatures. When you go to release the animal, make sure to always wear protective gear like strong gloves and long sleeves. This will ensure that you'll be safe in case of a retaliation from the raccoon. If you're interested in learning more about raccoon traps or want to read more about the other products we considered, see below! What Is a Raccoon Trap? Raccoon traps are devices designed to catch these cunning creatures before they can wreak havoc around your property. Many traps are humane cages which capture the raccoon so it can be released later by a wildlife sanctuary. There are several laws in place which prevent killing raccoons in a few states, so it's important to read up about specific rules before catching these critters. The title for this device is pretty straightforward. A raccoon trap is any sort of device made to catch and hold raccoons, so they will stop causing mischief around your property. There are a few different types available in the United States, and these traps adhere to strict rules and regulations. People prefer cages because they are the humane way to catch animals. Manufacturers design cages with a trap-and-release design so the raccoon can be let out at a separate destination. To check out how these traps work in action, see the video below. While there are some claw-like traps with teeth that hold a raccoon's arm or leg, they are unpopular because they are extremely painful and can cause permanent damage to an animal's body. What Are the Risks of Trapping Raccoons? Surprisingly, most of the risks from using these traps come from being in close contact with the caged animal. Raccoons can scratch and bite through the bars of the trap, so it's important to keep them far away from your body, even when carrying them. With any kind of animal bite comes the risk of disease transfer. In particular, raccoons can carry rabies. This disease is difficult to transfer to humans, but almost assuredly causes death once symptoms appear. The other main problem is the transfer of parasites. Raccoons can carry ticks and fleas, which will gladly live on and with humans and their pets. The easiest way to avoid this issue is to wear gloves and full clothing coverage when handling the trap. How Much Does a Raccoon Trap Cost? A cage trap can vary wildly, depending on size and sturdiness. A name brand. There are several big-box brands out there who specialize in crafting traps. Their designs are solid and get the job done...and the inflated prices sometimes reflect that. Flimsy craftsmanship. If you buy a product from a lesser-known brand, you run the risk of purchasing a trap with a much lower production quality. Even if it's being sold at a great price, this is something which should raise an eyebrow. It's difficult to pin down an average price for a quality raccoon trap, but luckily, we've got you covered. Check out our buying guide below for up-to-date pricing buttons. The biggest step in trapping a raccoon in a cage is actually getting it into the cage. To do that, you need to have some sort of bait. The truth is: raccoons will eat just about anything. You can use a specially formulated raccoon bait, or you can just use regular household foods like pizza crusts or watermelon. Think about it: these are the animals that go through your trash cans at night; they're not going to be too picky about what you place in the trap. Some pest control experts recommend that you stock the trap with similar foods that have attracted them to your yard. So, if they like to eat the veggie peelings from your trash, put some in the cage. Where Do You Take the Trap? As we mentioned earlier, there are a lot of laws about trapped raccoons. Some states require that you kill the creature on-site, while others insist it be brought to a vet or wildlife preserve to be euthanized. Most states do allow for relocation. However, it's best to check with your local wildlife division to familiarize yourself with your specific laws. During relocation, the raccoon is brought to a safe space (like a park or forest reserve) and released. Sometimes you can do this yourself, but usually you need to contact a humane or wildlife society. If you have babies but no mother, release them. The babies cannot be relocated alone and need to be captured with a parent. Nearly every state in the United States has laws governing who can trap raccoons and how to deal with them. For example, in Indiana it's illegal for someone to release a raccoon on property that is not theirs. In South Carolina, it's only legal to catch and kill raccoons from December 1st - March 1st. For more information about your specific state, check with the US Fish and Wildlife Administration's state-by-state tool. Here's the hard truth: raccoon traps can be a mixed bag. They do work most of the time, but raccoons are intelligent creatures. You'll be hard-pressed to catch the same raccoon twice. These little guys are difficult to outsmart! This is why it's important to bring trapped animals to a wildlife shelter or catcher to be released. 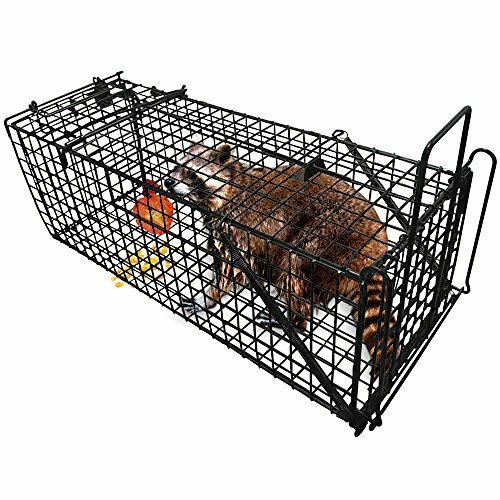 The Havahart 1045 Live Animal Two-Door Trap makes an ideal environment for catching raccoons. The trap is easy to set up and can be easily cleaned and reused. This particular trap was designed to enclose nuisance animals weighing 12lbs. and under, which means that it can be used for a multitude of different creatures in your yard. 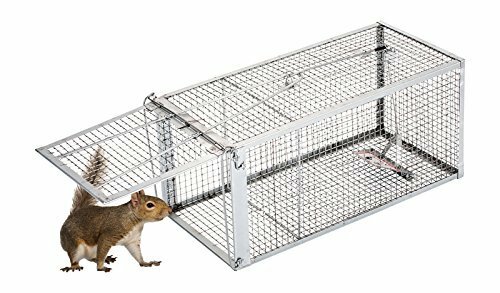 If you're got raccoons, opossums, squirrels, chipmunks, or any other vermin running around, this is a perfect option to trap them all. The Havahart 1045 can be baited and closes once the animal enters the main containment chamber. Animals can still breathe while inside and will not be hurt by any of the moving parts. The trap comes with convenient carrying handles so the user doesn't touch the captured animal. We recommend the Havahart to those who are looking for a safe trap that can be reused without requiring parts be replaced. The Amagabeli Garden & Home Live Animal Trap is made from a tough, rust-proof mesh that is difficult for raccoons and other animals to break. It can be used to trap all sorts of creatures, including raccoons, feral cats, opossums, and groundhogs. Unlike a lot of traps, the trigger rod on the Amagabeli trap is located on the outside so captured animals can't pull it. It comes with a handle and solid door which prevents animals from biting or scratching the person handling the trap. The trap comes with a 3-year quality guarantee and warranty. It's a breeze to return if the trap becomes damaged or breaks outside of normal wear and tear. We recommend the Amagabeli to people who want a sturdy, reliable raccoon trap which can last for years. The Ranger Products Animal Cage has one of the smoothest closing mechanisms out of all of the raccoon traps currently on the market. Animals that scurry inside will set off the door almost immediately. The door locks in place after being closed so it can't be pushed open. The trap is easy to carry so the user doesn't need to interact with the captured animal. The trap itself weighs 9 lbs. and can hold animals up to 12 lbs. This trap doesn't come preassembled, but the manufacturer includes a video to help with assembly. Once it's all put-together, the framework is collapsible for easy storage. We recommend this trap to people who want an inexpensive option that is easy for the average person to assemble! The Atomic Barbie Large Humane Trap is a humane trap that is highly affordable and is completely reusable. It can trap animals which weigh 10 lbs. or less and only weighs 2.5 lbs. itself. The Atomic Barbie trap is made from a lightweight mesh designed to be rust-proof and easy for the user to handle. The door mechanism locks behind the animal and can't be opened from the inside. This trap can be reused and is suitable for both indoor and outdoor use. We recommend this product to people who need a budget raccoon trap and don't want to pay and arm and a leg to have a raccoon-free yard. The Duke Traps Heavy Duty Cage is the heavyweight champion of raccoon traps. It costs more than most, and weighs a whopping 17 lbs., but it can hold raccoons that weigh up to 15 lbs. This trap has a solid locking mechanism and comes with a handle so it can be picked up safely. It's reusable and made from durable metal that can withstand raccoon claws and bites. The Duke Traps door will swing shut when the raccoon (or another type of nuisance animal) triggers the closing mechanism. The door can't be opened from the inside. We recommend this product to individuals who want a strong trap that can be reused for many years to come. This humane cage works well, can be reused, and doesn't hurt any of the captured raccoons.